The fact that more than 4,000 items are processed at Oktoberfest Munich’s lost & found each year gives you some idea of the scale of that event—and maybe the level of inebriation that occurs. Annually, more than 6 million people from all over the world attend Munich’s 16-day Oktoberfest—by far the world’s largest festival. The first Oktoberfest was held in 1810, and the tradition has been going strong ever since, although the Germans were forced to cancel their annual beer fest a few times due to war, cholera and (once) inflation. In a typical year at Oktoberfest, those 6 million thirsty attendees will consume almost the same number of liters of beer: about 6 million, or 1 liter each. That’s some serious suds. And in addition to that, half a million pork sausages, half a million chickens and 60,000 pork knuckles were eaten at 2012’s Oktoberfest, not to mention nearly a hundred oxen. 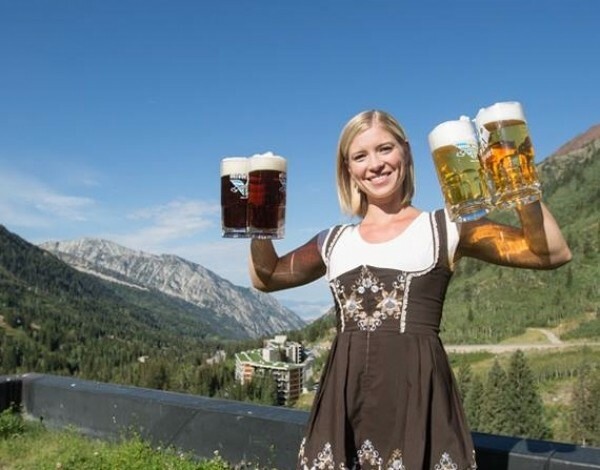 A little closer to home—and, granted, on a considerably smaller scale—Snowbird Resort hosts its own annual Oktoberfest, and has been doing so for more than 40 years, since 1973. That’s when a couple of nostalgic, lederhosen-clad Swiss dudes—reminded of their homeland by the majestic mountains at Snowbird—were inspired to play their accordions and sing songs in their native German. Today, Snowbird’s Oktoberfest attracts more than 60,000 visitors over its nearly two-month run: Saturday and Sundays Aug. 17-Oct. 13. In recent years at Snowbird’s Oktoberfest, visitors devoured some 6,000 pounds of bratwurst and weisswurst, 4,500 pounds of chicken and 2,000 Granny Smith apples in the form of strudel. Of course, much beer will be drunk as well. Suds for sipping at this year’s Oktoberfest include craft-made beers from Moab Brewery, Bohemian and Uinta. There’s also a specially brewed Snowbird Dunkelweiss from Squatters. And you can even pick up an authentic 1-liter beer stein ($9.95) like they have at the Munich Biergarten. In addition, there’s a wine garden featuring Joel Gott wines, a JÃ¤germeister tent and, in the Oktoberfest Halle, a bevy of Bavarian flavors including bratwurst, weisswurst, sauerkraut, spÃ¤tzle, beef rouladen and German chocolate cake. For Oktoberfest entertainment, there’s Salzburger Echo, the Polkatones, Alpenfolk, B&B All-Stars, Alpenbroz, Kerry Christiansen, Shan the Juggler, the Yo-Yo Man, the Dan Weldon Band, Ghostowne, Hectic Hobo, Space Turtle and others. One of my favorite Oktoberfest diversions is a tram ride up to Hidden Peak to listen to the alphorns echoing through the valleys all the way to Midway. For kids and kids-at-heart, the new Mountain Coaster is open during Oktoberfest, and there’s also face painting, carnival games, a climbing wall, bungee trampolines, a ropes course, the Mountain Flyer zip line and inflatables for kids. Can’t make it up to Snowbird? Well, you could throw your own little Oktoberfest at home with the help of some German brews. A good place to start would be with pouring a frosty glass of Ayinger Oktoberfest MÃ¤rzen ($3.11/500 ml). Tinted with amber, this deep golden MÃ¤rzen is quite malty and well-balanced with floral hops—crisp and tasty. Beck’s Oktoberfest MÃ¤rzen ($1.85/355 ml) produces a fizzy white head with a sweet nose of bread, toffee and caramel. The flavor is “fruits and nuts,” with typical MÃ¤rzen floral notes rounding things out. Each year at Munich’s Oktoberfest, the mayor taps the first keg to open the festival, and the keg he taps is Spaten. Spaten Oktoberfest MÃ¤rzen ($1.60/355 ml) is a rich, copper-brown color with a nice, lacy head and sweet, malty caramel notes. It’s a true representation of Munich-style MÃ¤rzen, and a beer that’ll lend a little German oompah to your Oktoberfest party. Prost!